Shoulder injuries amongst Queensland miners seems to be on the increase or at least it seems that way with an increase in work related shoulder injury referrals to Shoulder Guy Physiotherapy from miners across the state and even as far as PNG. Whether it be working with or near underground mining equipment, stepping off a long haul dump truck or securing a drilling rig in readiness to frack a coal seam; working in the mining industry can be and often is dangerous and (significant shoulder) injuries do happen. 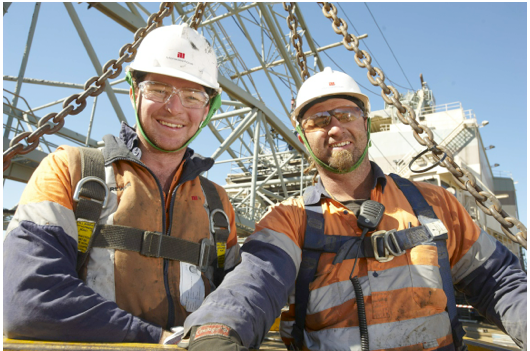 Thankfully, the majority of shoulder injuries we have seen directly related to the mining industry haven’t been life threatening but a dislocated shoulder or torn rotator cuff can have a significant impact on lost time injury (LTI) and comes at a personal cost to the worker. A recent Mining Australia article – “Mining Boom Leads to Injury Boom” gave an insight into the reasons for the mining injury boom and the need for quality medical and physiotherapy services in regional Queensland. It seem that these vital health and injury management services are still not available or not yet trusted by workers who predominately FIFO from the larger Queensland cities. Our practice has seen at least those commuting from Brisbane, preferring to seek specific shoulder injury management and advice back in the big smoke. In a recent conversation, with a female coal seam gas worker who had dislocated her shoulder on site, I was shocked to be told by her that the doctor at the local hospital treating her initial shoulder injury had never seen a dislocated shoulder before. She said, “this was a major factor in her seeking treatment here in Brisbane”. So, if you are seeking shoulder injury advice or expert shoulder treatment from a team dedicated to shoulder physiotherapy then pick up the phone and call us. Tagged bursitis, mining injuries queensland, Rotator Cuff Injury, shoulder impingement, Shoulder Physiotherapy, work related shoulder injury. Bookmark the permalink.